This is the last in this series. The blackboard theme has been big this year. Here the stamp set has been stamped with versamark then embossed with white powder on black card. The image has been mounted onto a piece of the paper stack then onto Cherry Cobbler card. 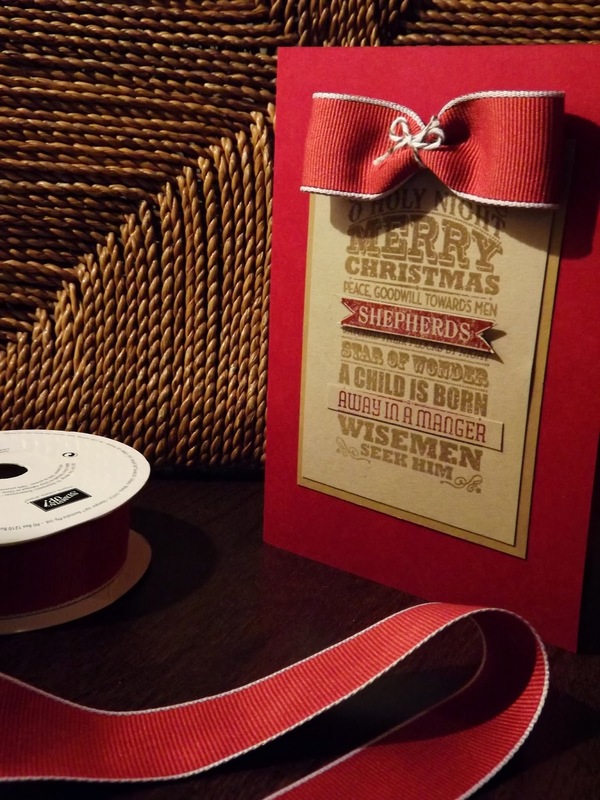 The piece is finished with cherry cobbler twine. Come back next week for something new. 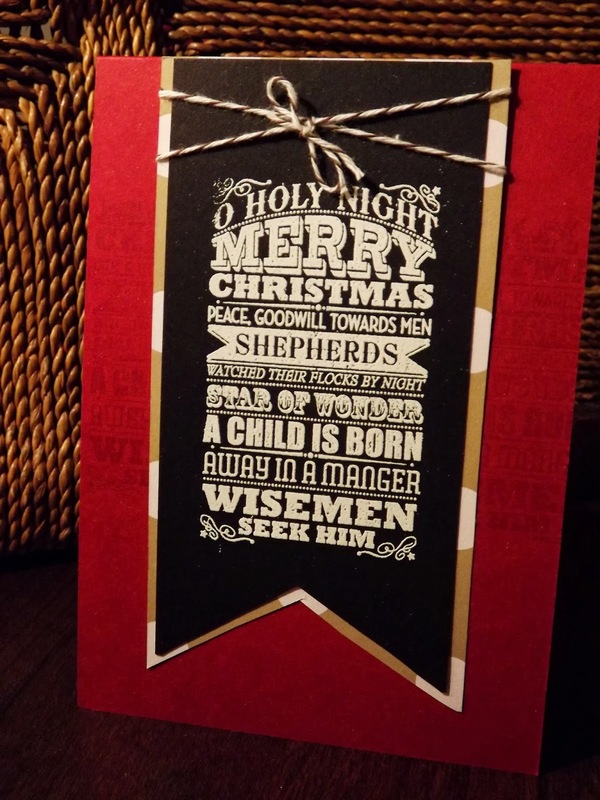 Another traditional card using the O holy Night stamp set. This uses the same method as a card previously posted this week but in blues. Here the stamp is stamped once in Baked Brown sugar and once in cherry cobbler. The latter has two phrases cut out then stuck onto the complete stamped image. The ribbon is the Cherry Cobbler in the seasonal catalogue. 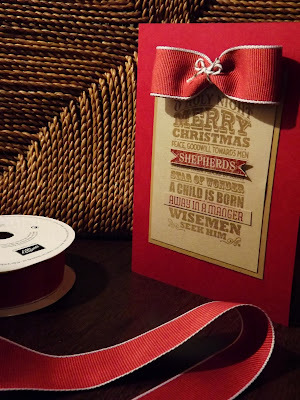 It is a beautiful ribbon and easy to make bows with. This uses the same stamp set as yesterday but in a more traditional way. The background is stamped with versamark and allowed to dry. The stamp is the inked with Cherry Cobbler and stamped on Crumb Cake and mounted onto Baked Brown Sugar. The card is finished with some cherry cobbler bakers twine and 3 small stars punched from the glimmer paper. A very simple quick card to make. The last one of this trio. I have stamped this once in Coastal Cabana and once in Island Indigo. I have cut two phrases from the darker colour and stuck one flat, the other used dimensionals to stick on. 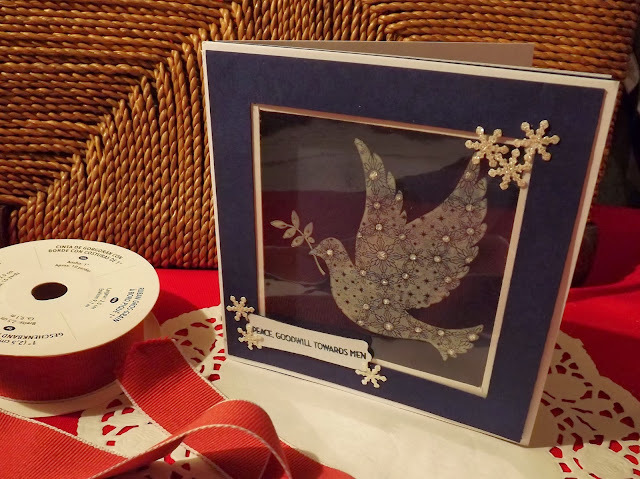 The silver ribbon and two rhinestones just finish the card off. I still had the snowflakes on my desk so just had to use them again. I have also used another piece of paper from the winter frost pack. 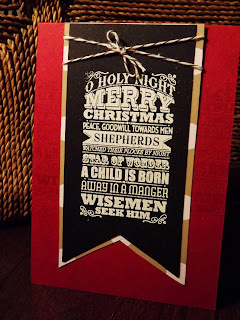 The O holy Night is a small stamp set, but the type set being different for each statement is so on trend. 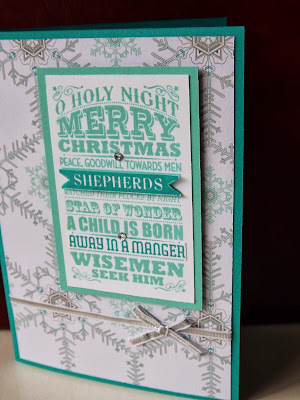 This was the first outing of the Festive Flurry stamps and dies. Using the winter frost suite of papers and cool blues they are a break from the traditional red and green. The stamps are a set of four the largest one being a good size so it is effective on its own, used here. I have used a glue pen and some fine glitter just to highlight parts of the snowflake and around the edge of the sentiment. A few mini snowflakes punched from glitter paper just complete the cool look. I love this stamp, used to make a shadow box card it works really well. Stamping on the rough side of the acetate means you get a good clean image. I have highlighted the centre of the patterns with a small dot of stickles. Love it.